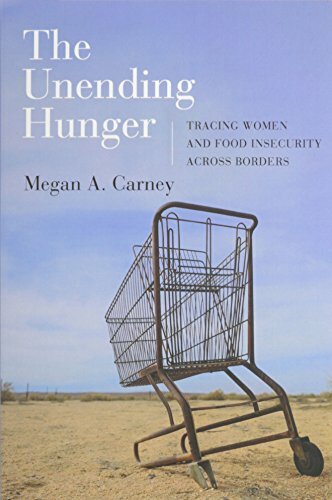 In her ethnography, The Unending Hunger: Tracing Women and Food Insecurity Across Borders, Megan Carney examines the impact of food insecurity on women’s migration experiences from Mexico and Central America to the United States. Recurring themes of suffering, hunger, and resilience shape the ethnography as Carney recounts the stories of the women and their experiences featured in her book. Hoping for a better life, more work opportunities, and an easier time meeting their families' basic needs in the U.S., the women in this study remarked that food insecurity in their home countries motivated their decision to migrate. Yet, contrary to expectation, these women found that their ability to feed themselves and their families minimally improved, if at all, or worsened upon arrival. In order to grasp the significance of these key themes, it is helpful to understand the relationship between what Carney terms the biopolitics of food insecurity and the biopolitical project of food security. The biopolitics of food insecurity describes the ways people's access to food varies based on their identities, such as race, class, and citizenship status. It also accounts for how inadequate and inconsistent access to enough nutritious food leads to poor health and makes food-insecure people into targets for programs and policies that try to eliminate food insecurity. The programs, policies, and other efforts toward eliminating food insecurity make up the biopolitical project of food security. Food insecurity is the thread that weaves all of the women’s stories together in Carney’s ethnography; it is present at all stages of their migration journeys and is often an unexpected consequence of living as a Mexican or Central American migrant in the U.S., a place that grows increasingly unfriendly to those migrants wanting to call it home. What began as a hopeful journey for a better life in the U.S. became one of prolonged suffering upon arrival. The women in this study revealed the ways suffering takes on physical and social forms, lamenting about weight gain, depression, diabetes, isolation, and a desire for the past. Underneath the narratives of physical hunger lies a narrative of hunger for home, human connection, and family intactness. The women in this study remarked that since migrating to the U.S., food insecurity has thwarted their efforts to care for their families through food. For example, some of the women noted that former eating practices that brought their family together and provided a sense of familial connection were hindered by not having enough food to eat in the first place. These multiple narratives of hunger allow us to think more broadly about how food influences our health physically, emotionally, and socially. The experiences of these women also speak to the ability of food to create social ties and sustain families, relationships, and transnational livelihoods, further highlighting the imaginary nature of political borders and the projects that maintain them. Despite struggling to find enough nutritious and affordable foods to feed their families, the women in Carney's ethnography demonstrate unspeakable resilience in the face of daily adversity. Facing many barriers to feeding their families, the women found empowerment through various practices. These include, for some, relying on social networks for sharing food and expenses and balancing their use of resources. Carney uses these women’s experiences to illustrate how hope and resilience can be as unending as the hunger of suffering and loss. Addressing the biopolitical project of food security, Carney raises the question of how we can secure reliable access to nutritious foods for migrant women and their families who suffer from food insecurity. While food assistance programs are certainly useful, Carney calls attention to their unsustainability in the long term and how they can, in fact, create more inequality and health problems for the individuals and families that use them. She calls for a committed effort toward ensuring food security for all by moving beyond food assistance programs and tackling the issues at the root of food insecurity. Carney argues, for example, that greater consideration be paid to immigration and border policy reform, including adding food insecurity to the list of reasons a person can seek authorized entry into the U.S. This and the many other suggestions Carney puts forth allows us to consider the ways we can strive toward a more just and equitable society where all are able to ensure that they and their loved ones have enough to eat. Carney’s ethnography makes a timely contribution to the field of anthropology and studies of transnational migration. By foregrounding migrant women’s experiences with food insecurity, Carney creates space to think more critically about the role food plays in their everyday lives. By extension, this challenges all of us, no matter our identities, to examine our own relationships to food. In doing so, we can call into question any assumptions we have made about our ability to access to certain foods, why we eat the foods we do, where we get the foods we eat, and how we make decisions about feeding ourselves and our families. As Carney demonstrates, nothing about our relationships to food can be taken for granted as they are shaped by political and economic forces that make food insecurity and security possible. By foregrounding migrant women’s experiences with food insecurity, Carney challenges us to think more critically about the role food plays in their everyday lives, and by extension our own relationships to food.